The Vodafone Smart 4 Turbo user manual consist of 72 pages. It's devided into 19 section. 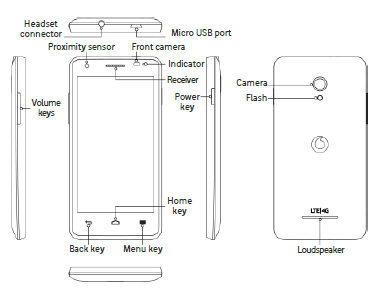 For owner of this device, you can find information for example about phone layout, tutorial Insert the SIM card and the microSD card, Locking/unlocking the screen, using home screen and touchscreen, Using the hard keys, Using the Quick Settings button on page 7, Conference calls, Importing contacts from SIM card orstorage on page 16, etc. Then about Connecting to Wi-Fi using WPS on page 25, Sharing your phone's data connection as a portable Wi-Fi hotspot, using bluetooth, using browser for access internet, using camera on page 31, Recording a video guide, usign Google Play Music, Changing the phone ringtone on page 41.